Herb and Mark having a good time in February before he got sick. His parents Meta and Frank but, its his son Mark with them. Herb with daughter, Jan on her wedding day and son. Mark. 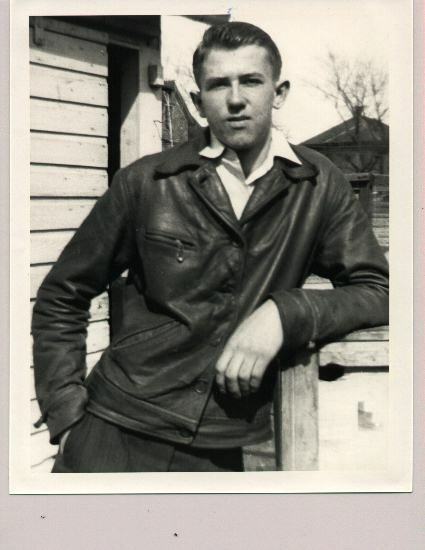 Herbert W. Holler, 87 of Green Bay, died November 1, 2015 at his home in Green Bay. He was born August 3, 1928 in Milwaukee, the son of Frank and Meta Holler. Herbert graduated from the University of Wisconsin-Madison with a B.S. in Business Administration, CPA, Phi Beta Kappa. He joined Price Waterhouse & Co. and traveled auditing numerous companies in the Midwest. He married Ruth Chizek in 1950 and moved to Green Bay in 1959 where he worked for Ft. Howard Paper Company. They raised two surviving children, Janine Whitacre (Spokane, Wa.) and Mark Holler (Napa, Ca.) and enjoyed summers and fishing on the Bay at their family retreat in Door County. 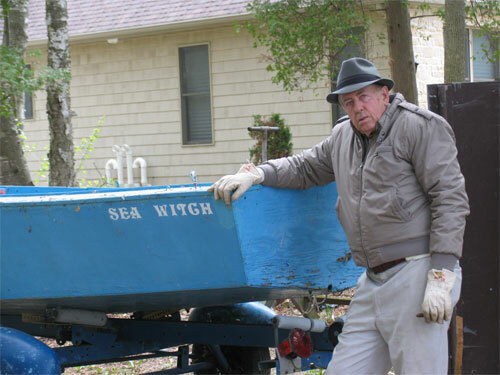 He loved boating and learned woodworking to build 4 sailboats from scratch. He is also survived by his wife, Ruth, five grandchildren and sister-in-law Pat Holler. He was preceded in death by his parents, Frank and Meta Holler and his brother Tom Holler. Below is a corporate photo of him with the executive management of Kearney Trecker a large Machine tool manufacturer in Milwaukee. He was CFO. His kids Mark and Janine and Herb with his first grand child Anjanette. Below Grandkids Bryan, Kristin Natalie and Cameron. Below is Leah, Herb and Ruth's caregiver who helped care for Herb at home during his last days. Herb's Boats. He built all of these except the blue boat on the left. This day we set up buoys and had a race. It was crazy but, made a great memory. 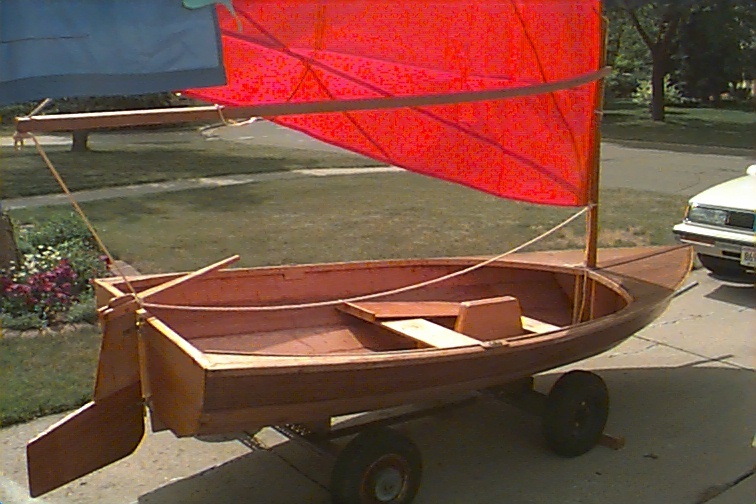 Below is the Sailfin sailboat that was the last boat he built. It's still in the boat house in Door County. Below is Herb with the largest sailboat he built. Below is Herb at one of his computers which were always up to date. He was a first class technology geek trying out every new computer peripheral widget. He especially loved recording, TV and radio programs to cassette, reel to reel tape, VCR, CD, DVD and even Flash Drives. His photography and video camera use to record the events of our lives were directly related. We found 50 photo albums, and boxes of CDs and DVDs, and even 8mm film with content he captured. This is the source of most of the content presented here. Herb disassembling the old outhouse at the cottage. Captain Herb with Jan and Bryan on the Bay. Herb going out for a sail on the bay off the cottage. Green Island in the background. He loved and spoiled his cats especially one-eyed Bebe which lived for almost 20 years..
Herb a few years back. Maybe high school? Here's Herb with a sheephead he caught off of the cottage. He liked to wear hats. He had to put up with a lot of what the sign refers to. Herb in April of 2015 before he got sick. Herbert Holler was a mighty nice guy. He touched a lot of lives in a positive way even as he was leaving us.. If you would like to contribute to this memorial please e-mail pictures, stories, videos or whatever to mholler@pacbell.net. Please do contribute.